Stories of ultra-rare muscle cars sitting in barns are truly the car person's equivalent of "the fish that got away". A few years, a hazy memory or just a desire for a good story have all too often put a Hemi under the hood of a dusty small block Barracuda or turned an average rot box Camaro into a ZL1. 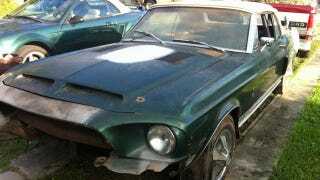 With this in mind, the garage fresh 1968 Shelby GT500 you see here becomes even more of an amazing find. You know the one about the 23 year old girl who traded in her 1965 GT350 on a brand new GT500 in 1968 and drove it a mere 53,000 miles until she put it into hibernation for three decades? For once it's actually true and this Ebay seller has the car to prove it. The car has some surface rust and there's a non running small block underneath the hood, but it certainly appears to be a Shelby GT500 convertible that has been sitting since 1981. According to the seller it was the lackluster performance of the replacement small block—installed after the original big block was blown—that resulted in a 31 year hibernation for this rare 1968 Shelby. After being unearthed a few weeks ago this Shelby has now hit Ebay cleaned up and ready to find a new owner. We're sure the fact the car's creator died this past week has absolutely nothing to do with the timing of the listing. Significantly less transparent is where the reserve price on this rare Shelby lies. Using the 30 day quadruple value Enzo Ferrari death formula laid out in the listing description, it would certainly be quite a bit north of the current $45,100 high bid. We can't imagine the excitement of discovering a relatively rust free and complete convertible Shelby surrounded by the typical junk of a seemingly average garage. Perhaps the coolest thing about this GT500 are what these pictures do to renew our admittedly foolish hopes of stumbling across one of the rare muscle cars still out there waiting to be discovered.